Hamburg, Germany's mighty port city, has risen from the ashes of World War II with a gleaming new skyline and a brisk creative energy. 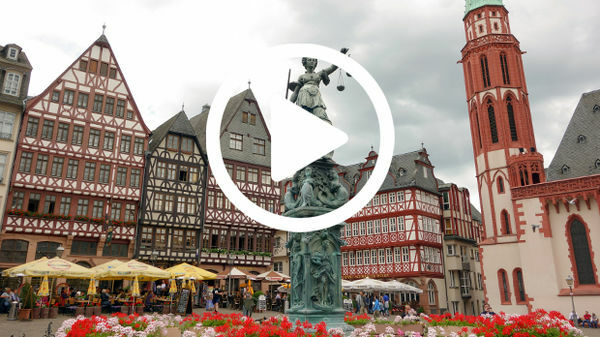 From there, we visit the great historic sights of Martin Luther and the Reformation (Erfurt, Wittenberg, and Wartburg Castle) before finishing in the capital of Franconia: wine-loving Würzburg. Hamburg's impressive Rathaus, a mix of Historicist styles (from 1897), was designed to showcase the wealth and grandeur of turn-of-the-20th-century imperial Germany. While the building is called a "City Hall," Hamburg actually forms its own Land (state) within the Federal Republic of Germany, and the council that meets in the City Hall chambers is more like a state legislature (free to enter entrance hall and inner courtyard; daily English-language tours available). Before the mid-20th century, downtown Hamburg's skyline had five main churches, each with a bold tower. Today there are still five towers…but only four churches. The missing one is St. Nikolai. It was designed in Neo-Gothic style by British architect George Gilbert Scott, and for a brief time after its completion in 1874, it was the world's tallest church (at 483 feet; its spire is still the fifth tallest in the world). The church was destroyed by the Operation Gomorrah firebombing in 1943. Its tower (open to visitors) and a few charred walls have been left as a ruin to commemorate those lost, and museum exhibits in the church cellar detail Hamburg's wartime destruction. As with similarly ruined churches in Berlin and Coventry (in England), a stroll here, between the half-destroyed walls of a once-stunning church, is an evocative reminder of the horrors of war (ruins free to explore and always viewable). For visitors, the heart of the complex is the Plaza level, which connects the renovated old harbor warehouse below with the modern glass tower above. From the main entrance of the 360-foot-tall, 360-foot-long structure, visitors ride a 90-yard-long escalator (dubbed the "Tube"). At the top you'll enjoy a spectacular view down the Elbe toward the harbor and docks. A second, shorter escalator takes you to the Plaza level, where you'll find an outdoor promenade that wraps around the entire level (plus a café and souvenir shop). On July 17, 1505, a young student knocked on the door of this monastery and declared that he wished to become a monk. Martin Luther lived here for several years — even after becoming a priest and a part-time professor — until he settled in Wittenberg in 1512. Inside the still-active complex, you can see the church, a small museum of Luther artifacts, and the cell where Monk Martin lived. While the museum and cell are more accustomed to German-speaking groups, they welcome individuals, and their exhibits are explained in English (church is free to enter while museum charges small fee; both open daily). Located in the town of Bad Frankenhausen, about 30 minutes north of Erfurt, this museum holds a massive round painting showing the bloody Peasants' War of 1525. It's housed in a 007-looking building at the top of the hill where 6,000 peasants, armed with shovels and axes, were slaughtered while battling the well-armed troops of the Holy Roman Emperor, marking the end of the Peasants' War. In the early 18th century, Würzburg's powerful prince-bishop decided to move from his hilltop residence at Marienberg, across the river, into new digs down in the city. His opulent, custom-built, 360-room palace and its associated sights — the chapel and garden — are the main attractions of today's Würzburg. This Franconian Versailles features grand rooms, 3-D art, and a massive fresco by Giovanni Battista Tiepolo. The palace has three sections: the central main rooms, the North Wing, and the South Wing (with the dazzling Mirror Cabinet). The Residenz is impressive, yet quickly taken in; it's less overwhelming to visit than many other European royal palaces. Hi, I'm Rick Steves, back with more of the best of Europe. And this time we're enjoying some under-appreciated corners of Germany, both old and new. It's Hamburg, and a whole lot more. Thanks for joining us. 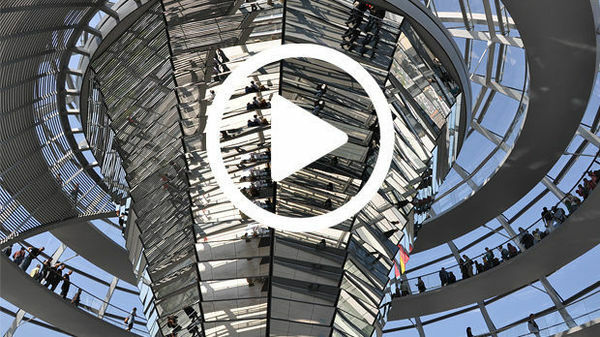 Germany is Europe's leading country in many ways. It dominates Europe's economy today and has long had a huge impact on events shaping the continent. We'll see that by exploring Hamburg, its mighty port city, and then heading south to the stomping grounds of a single monk who, 500 years ago, changed the world. After enjoying Hamburg's inviting parks and lakes we'll see how its architecture ranges from some of Hitler's left over giant concrete bunkers to cutting-edge modern buildings. We'll explore a vibrant counter-culture neighborhood. And after marveling at Hamburg's vast warehouse district, we'll take the best harbor tour in Europe, sailing under its striking new skyline capped by a towering new concert hall. Then we'll delve into the places where Martin Luther kicked off the Reformation 500 years ago — from the city where he preached and taught, to the castle in which he hid out from the Holy Roman Emperor. We'll learn about the chaos he triggered along with the progress. Finally, for a contrast to all that stern Protestantism, we'll visit exuberantly Catholic Würzburg and admire the elegance of its Residenz, the palace of the prince bishops of Franconia. In the heart of northern Europe lies Germany. After touring Hamburg, we head south to the Luther cities of Wittenberg and Erfurt, and finish in Würzburg. Hamburg is Germany's second-largest city. Like other "second cities" — Chicago, Glasgow, St. Petersburg — it has a spirited pride. While yet to be discovered by American travelers, it's a popular destination with Germans for its music, theater, and riverside energy. A century ago, Hamburg's port was the third-largest in the world, with strong connections both east and west. Heavy damage in World War II devastated the commercial center. During the Cold War, which followed, trade to the east was cut off. Port traffic dwindled, and so did the city's influence. But Hamburg's been enthusiastically rebuilt, and, since the reunification of Germany just a generation ago, it's gaining back its former status as a leading trade center. And it's become one of Germany's most desirable places to live. The city's delightful lakes were created in the Middle Ages, when townsfolk built a mill that dammed the local river. Back in the 1950s, a law guaranteed public access to the lake for everyone, and today, peaceful paths and bike lanes are a hit with locals. On a nice day, the lake is dotted with sailboats. On the far side, lush inlets reach into fancy residential neighborhoods. Along with plenty of downtown parkland, the lakes provide Hamburg — one of Germany's greenest cities — with an elegant promenade that comes complete with top-of-the-line shops. Just a block away, its massive city hall, built in the 19th century, overlooks the lively scene. It's flanked by graceful arcades and surrounded by plenty of commerce. Its bold architecture and maritime atmosphere gives this northern-most Germany city an almost Scandinavian feel. With its trading heritage and a strong economy, Hamburg's downtown showcases a wealthy city that rose like a phoenix from a terrible recent past. You'd hardly know that this was one of the most heavily bombed cities in Germany in World War II. With its strategic port, munitions factories, and transportation links, Hamburg was a prime target for Allied bombers. American and British commanders had an innovative plan with a horrific goal. Its name? Operation Gomorrah. On July 27, 1943, they hit targets first with explosive bombs to open roofs, break water mains, and tear up streets. The purpose? To make it hard for firefighters to respond. Then came a hellish onslaught of incendiary bombs. 700 bombers concentrated their attack on a relatively small area. The result was a firestorm never seen before. The intensity of the bombs actually created a tornado of raging flames reaching horrific temperatures. Thousands suffocated inside their air-raid shelters and those outside were sucked off their feet, disappearing up into the fiery vortex. In three hours, the inferno killed over 35,000 people, left hundreds of thousands homeless, and reduced eight square miles of Hamburg to rubble and ashes. Somehow the towering spire of St. Nicholas Church survived the bombing. It and the ruins of the church itself are now a memorial, left to commemorate those lost and to remind future generations of the horrors of war. Where the original altar once stood is now a simple yet poignant concrete altar by Oskar Kokoschka. The memorial's underground museum quietly tells the story. You'll see scorched and melted fragments demonstrating the heat of the firestorm and examples of the futility of trying to survive such a bombing. The museum also shows foreign cities that Germany destroyed. That's because Germans make a point to acknowledge the suffering they inflicted on others when remembering their own suffering. Though Hamburg is mostly rebuilt, many WWII-era bunkers were just too solid to destroy. So they survive, incorporated into today's contemporary scene. This mammoth structure has 10-foot-thick reinforced concrete walls. With windows cut through the concrete, it's surprisingly inviting. While once hosting gunners trying to shoot down Allied planes, today bomb-hardened staircases lead to music shops and dance clubs. And drummers here will never draw complaints from their neighbors. Nearby, another bunker — this one with colorful graffiti — is now a climbing wall in a pleasant neighborhood park. While Germany is known for its order and efficiency, that social conformity comes with a flip side — neighborhoods well-known for their energetic counter culture. Hamburg's trendy Schanze quarter offers a breath of fresh cultural air. A popular neighborhood, it has so many cafés, its main street is nicknamed "Latte Macchiato Boulevard." This fun-loving edge is nothing new to Hamburg. Nearby, Hamburg's Reeperbahn neighborhood has long been Germany's most famous entertainment zone. It gained notoriety as a rough and sleazy sailors' quarter filled with nightclubs and brothels. But, as the city's changed, so has its entertainment district. In one generation the Reeperbahn has earned a new, more respectable image — a destination for theater and live music. Today this street — where the Beatles launched their careers back in 1960 — is a fun scene lined with playhouses. Considered the Broadway of Germany for its many musicals, the boulevard attracts theater-goers from all over the country. Hamburg, 60 miles from the North Sea, on the Elbe River, has long been a vital port. Its waterfront is designed to accommodate the Elbe's 13-foot tides. And, in anticipation of a rising sea level and potentially devastating storm surges, miles of embankments have recently been fortified. Along with making the city safer, this stretch comes with a design element that gives Hamburg a delightful new park-like stretch of harbor front. Long a busy ferry terminal, this floating dock is now a thriving tourist zone. From here, with the aroma of pickled herring and French fries, you can enjoy the harbor and the energy of the city's port. For German Americans, Hamburg has a special meaning, because their ancestors likely sailed from this harbor. Between 1850 and 1930, millions of Germans emigrated to the United States from right here. The port has always been a central feature of Hamburg. It evolves and grows with the city's needs, and with changes in shipping technology. The vast Speicherstadt, or "Warehouse City," was originally a seemingly endless grid of riverside warehouses. Today, these buildings, once filled with cotton, rubber, and tobacco, house engaging museums, offices, and hip restaurants. While those venerable warehouses survived, much of Hamburg's old port was abandoned when the shipping industry moved to a larger and more modern port nearby. Then, a generation ago, the city realized that what had become a derelict industrial wasteland was potentially prime real estate. The result: HafenCity, a huge urban development project. With this new green and integrated urban center, downtown Hamburg became about 40 percent bigger, and once again, the city faces its river. The re-energized district seems a city in itself, mixing its maritime heritage with striking modern architecture. Worked into the plan are both high-end condos and affordable subsidized housing. Hamburg has created a healthy mix of business, culture, and leisure — convenient for the modern citizen without a car. Today, city planners from around Europe look to Hamburg for inspiration in designing integrated urban centers. The centerpiece of HafenCity is the striking Elbphilharmonie — a combination concert hall, public plaza, hotel, and apartment complex. Its daring design and huge size fit in well with the massive scale of the surrounding port. And, when approached by water, it resembles the looming prow of the steamer ships that first put Hamburg on the world map. An unforgettable capper to a Hamburg visit is its harbor tour — the best of its kind in Europe. You'll see plenty of Hamburg's bold new architecture as well as its more established beach communities, lined with mansions. But mostly, the hour-long cruise gets you up close to Hamburg's shipping industry — all those enormous container ships, cranes, and dry docks. Accommodating 12,000 vessels a year, it's Europe's second-busiest harbor and earns the tag-line "Europe's gateway to the world, and the world's gateway to Europe." Germany is compact, with an impressive infrastructure. Within a few hours, we're in eastern Germany, and Martin Luther country. In 1517 the German monk Martin Luther was a professor here in the university town of Wittenberg. As professors routinely did back then, he tacked some points for discussion on the door of the church — which served as a kind of bulletin board for the university community. These 95 points, questioning practices of the Roman Catholic Church, kicked off more than a discussion. They kicked off the Protestant Reformation. Martin Luther unleashed a world of change. The Reformation was a political and theological storm that divided Christendom in western Europe into Roman Catholics and Protestants. It ignited a century of religious wars and, along with the humanism of the Renaissance, it helped bring Western civilization out of the Middle Ages and into the modern world. 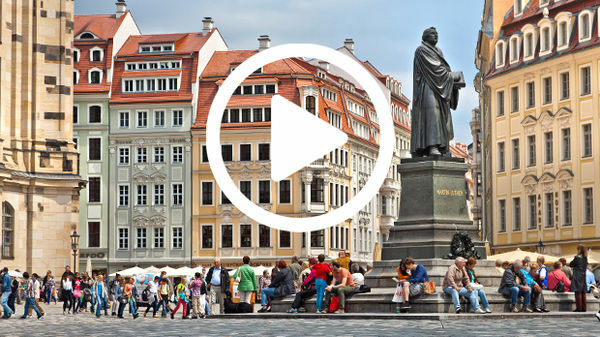 2017 marked the 500th anniversary of the Protestant Reformation, and eastern Germany is famous for its Lutherstadts, or "Luther cities," and sights associated with that tumultuous time. The three most interesting Reformation stops are Erfurt, where Luther studied and first became a monk; Wartburg, the castle where he famously hid out and translated the Bible into German; and Wittenberg, where he taught, preached, and led the Reformation. Luther went to law school here in Erfurt, and today, this half-timbered medieval town, with a shallow river gurgling through its center, remains an charming destination that Luther himself would recognize. Erfurt's atmospheric Merchants' Bridge is lined with shops and homes. Then, as now, merchants live upstairs above their shops. This is the land of fairy tales and the Brothers Grimm, fine woodcarvers, and fanciful puppets. You can peek into the workshop of Martin Gobsch. Observe him at work. And don't leave without popping a coin into his tiny theater. The evil queen welcomes you into the dreamy world of Snow White. Separate vignettes tell the story. It all leads to the happy ending, when the charming prince whisks Snow White away. Back in 1505, as a young student, Martin Luther became a monk in Erfurt's Augustinian monastery. In this church he gave his first Mass. Its small museum includes Luther artifacts and the simple cell where the novice monk lived. Little did they know that this humble novice would change the course of European history. Nearby is Wittenberg. Around 1500, the local ruler, Frederick the Wise, was establishing the town as his capital. He invited young Martin Luther to join the faculty of his university. The main square is dominated by its town hall and a statue remembering the "Great Reformer." Wittenberg's top sight is the Lutherhaus, where Luther lived. Today it's an excellent museum displaying original artifacts — the pulpit from which Luther preached, portraits of Luther and the other reformers, and the Bible Luther boldly translated from Latin into the people's language. Five hundred years ago, the selling of forgiveness and church corruption stoked public discontent with the Roman Church, which led to the Reformation. This is a letter of indulgence, one of countless fund-raising coupons the Church issued. These were sold to the faithful for religious favors such as reducing time for dead loved ones in purgatory. Their money would fill boxes like this, and eventually ended up in Rome to fund the pope's lavish world. Corruption like this inspired Luther to confront the Church. And it was the invention of the printing press with movable type by Gutenberg in the same generation that enabled reformers like Luther to spread their ideas. Luther wrote in the peoples' language, and sold more than a quarter million booklets like these. Like social media empowers popular movements today, Luther's pamphlets went viral. He was the bestselling German writer of the 16th century. Wartburg Castle is a popular stop on the Luther trail. When Luther spoke out against Church corruption, he was declared an outlaw and needed to run for his life. A sympathetic German prince gave him refuge. Disguised and under a fake name, Luther hid out here in this castle. The actions of this solitary monk brought far-reaching changes. Believing that everyone should be able to read the word of God, Luther began the daunting and dangerous task of translating the New Testament from the original Ancient Greek into German. He used simplified language — as he said, "like a mother talking to her children." Just as the King James version of the Bible did for English, Luther's translation helped to establish a standard German language that's used to this day. Luther's translation brought the Bible to the masses. As Germans actually read the Bible, they saw, as Luther had, that there was no mention of indulgences, purgatory, or even a pope. Just as the Church had feared, this further fanned the fires of reform. This part of Germany was ground zero for the century of religious wars Luther's reforms unwittingly unleashed. A vivid portrayal of that tumultuous time with an intriguing communist twist can be seen above the town of Bad Frankenhausen. It's a huge 360-degree panoramic painting commissioned in the 1980s by the communist East German government. The Peasant's War Panorama, 400 feet around, was painted as communist propaganda. It remembers the 6,000 peasants who were slaughtered in a single battle. Armed with little more than shovels, they rose up against the Church and the ruling class during the Reformation. The detail is vivid. Using this popular revolt 500 years ago, it hammers home a familiar theme during the Cold War. Whether 16th-century peasants or 20th-century workers, the people's struggle is long and ongoing. The panorama portrays more than just a horrible battle. It represents the bloody transition between the medieval and the modern worlds. At the base gather 20 great humanists, change agents at the end of the Middle Ages — Luther, Erasmus, Copernicus, Columbus, and more. Above them rages the colossal battle under a rainbow, imperial troops on the left, doomed rabble on the right. Nearby an aristocratic couple dances before a gallows. The message? — The elites continue to win. Until German unification in the late 1800s, Germany was fragmented, a collection of small independent states. After the Reformation, those in the north ended up Lutheran (or Protestant), and those in the south remained Roman Catholic. A few hours south of Luther country takes us across that religious divide and into the enthusiastically Catholic region of Franconia and its capital city, Würzburg. Würzburg is surrounded by vineyards and straddles the Main River. Like so many German cities, it was devastated by WWII bombs. But, while cities like Hamburg and Frankfurt rebuilt on a modern grid plan, Würzburg recreated its charm by rebuilding according to its original layout. The marketplace is an inviting scene. Its 200-year-old obelisk features Romantic maidens selling their produce. And to this day, the square still hosts a charming market. This tourist-friendly town is easy to navigate by foot or by streetcar. Today, nearly a quarter of its 130,000 residents are students, making the town feel young and vibrant. The town bridge, from the 12th century, is one of Germany's oldest. It's decorated with statues of Würzburg's favorite saints and princes. And it's busy with people out and enjoying the moment. Scenes like this are ideal for connecting with locals. Würzburg was the capital of the German state of Franconia. In the 1700s, it was ruled by a prince-bishop. He exercised both secular and religious authority, and this grand palace was his home. Opulent as a German Versailles, the prince-bishop's Residenz is the main attraction of Würzburg. Imagine VIP guests arriving for lavish parties. Met here by the prince-bishop, they'd glide gracefully up this elegant stairway, enjoying a grand fresco as it opens up overhead. Dating from about 1750 and by the Venetian master Tiepolo, it illustrates the greatness of Europe with Würzburg at its center. The hero is the esteemed prince-bishop, honored by a host of Greek gods affirming his rule. Ringing the room are allegories of the four continents, each with a woman on an animal and celebrating Würzburg as the center of the civilized world. America, desperately uncivilized, sits naked with feathers in her hair on an alligator among severed heads and a cannibal barbecue. Africa lounges on a camel in a land of trade and fantasy animals. Asia rides her elephant in the birthplace of Christianity, marked by crosses. Europe is the center of high culture, and Lady Culture herself points her brush not at Rome…but at Würzburg. The adjacent Imperial Hall is a fine example of Baroque — harmony, symmetry, light, and mirrors. Its ceiling is also by Tiepolo. Typical of the Baroque movement, he was a master of three-dimensional illusion, and he'd heighten the illusion with some fun tricks. Notice how 3-D legs and other objects dangle out of the 2-D frame. The art, like nearly all art of that day, was propaganda, paid for and serving either the State or the Church. In this case, it's both. Here, the Holy Roman Emperor bestows upon the bishop of Franconia the secular title of prince. The bishop, now the prince-bishop, touches the emperor's scepter, performing an oath of loyalty. From this point onward, the prince-bishop wears two very powerful hats at the same time. A string of splendid rooms evolve from fancy Baroque to fancier Rococo. It all leads to the 18th-century Mirror Cabinet. This was where the prince-bishop showed off his amazing wealth. It features kilos of gold leaf, lots of exotic Asian influence, and eye-popping extravagance. As for the commoners, we were finally allowed inside this glorious palace about two centuries later. I hope you've enjoyed our visit to dynamic Hamburg, the fascinating Luther cities, and Würzburg — with its Baroque charm. I'm Rick Steves. Until next time, keep on travelin'. Auf Wiedersehen.